The narrow road leading to the church in Findon is lined on both sides with trees and on one old beech tree stump I found some intriguing fungi, which as usual I haven’t managed to identify. Of course I tried some small samples out in the dyepot but sadly, as the photo below shows, the results were not particularly worthwhile. These samples were all dyed using an alum mordant. These fine specimens looked wonderful growing all around the tree stump and gave the colour shown on the left-hand skein (plus a pinch of iron) and the centre skein. These were lying on the grass and looked quite sinister. 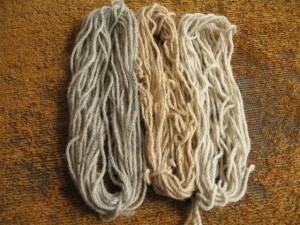 They gave the colour shown on the right-hand skein. 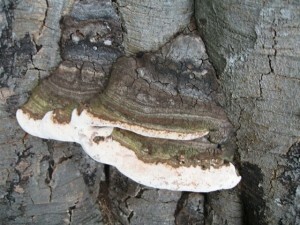 I think this might be a specimen of Hoof Fungus Fomes fomentarius. 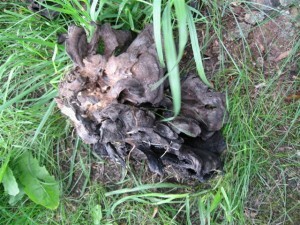 It certainly resembles a horse’s hoof and I didn’t want to disturb it for the dyepot. 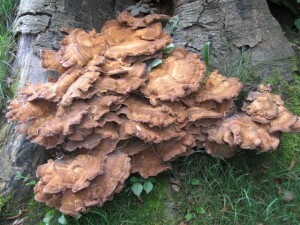 Might the upper fungus in this photo be Ganoderma applanatum or Artist’s fungus? 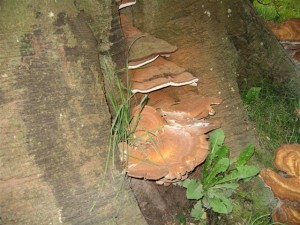 Whatever these fungi may be, they looked too attractive to sacrifice for the dyepot. A few days later my husband pointed out some mushrooms growing on our front lawn, which I think are probably a species of Hygrocybe. These proved more useful in the dye pot and gave a pretty shade of yellow on an alum mordant. 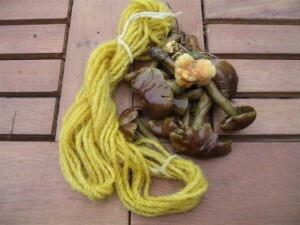 I’m afraid I forgot to photograph the mushrooms before I used them in the dyepot, so the photo below of the dyed skein shows the used mushrooms from the dyebath, plus one fresh mushroom I managed to find. I should also add that the depth of yellow achieved was actually considerably deeper than it appears in the photo. I’m afraid I haven’t yet managed to get round to starting any dyeing projects, as we are spending so much time with our granddaughter and also trying to explore a little of the local area. We recently made a trip to Bosham, a delightful village near Chichester and known to be the oldest site of Christianity in Sussex. Bosham has many beautiful old buildings, including a wonderful church dating back to Saxon times, some parts of which have survived from this period. 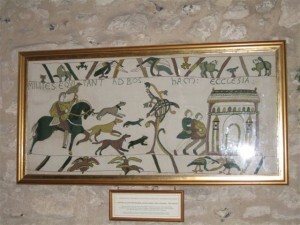 Perhaps Bosham is most famous for being depicted in the Bayeux Tapestry. 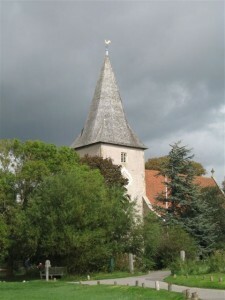 Harold, Earl of Wessex, the future king, had a home in Bosham and in the scene from the tapestry he is shown riding to Bosham and entering the church, before embarking on his ill-fated trip to Normandy in 1064. Bosham church also has a memorial to one of King Canute’s daughters who, according to tradition, drowned and was buried in the church. 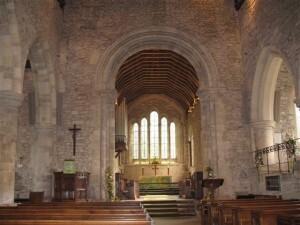 In 1865 a small stone coffin was found which was thought at the time to be from the 11th century. When in 1954 the coffin was again exposed a second larger coffin was found nearby containing some bones. However, without closer examination, precise dating of the coffins is difficult and the truth of this story has not been verified. This part of Sussex has many other historical sites to visit and next on our list is the Roman Palace at Fishbourne, which has the most remarkable Roman mosaics. We visited the palace many years ago but a further visit is certainly well overdue. 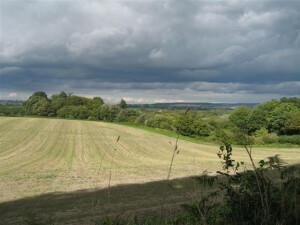 The other museum I’m looking forward to revisiting is The Weald and Downland Open Air Museum at Singleton. So expect more about these two places in due course. The journey home once again took us over the downs, which are among the most characteristic features of the Sussex landscape.